Operation SHINGLE: the Allied landings at Anzio. Flight Lieutenant G J Cox walks from his Supermarine Spitfire Mark IX of No. 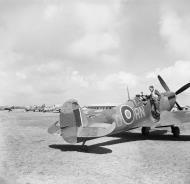 72 Squadron RAF at Lago landing ground, near Castel Volturno, after a patrol over the Anzio beach-head. Ground crew hurriedly service his aircraft in readiness for the next sortie. 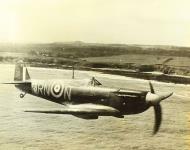 Cox, with six and two shared victories to his credit, was commencing his third tour of operations flying as a supernumerary pilot with 72 Squadron, prior to assuming the command of No. 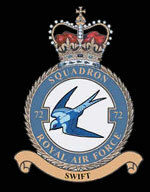 92 Squadron RAF at Marcianese the following month. Two pilots of No. 72 Squadron RAF, one South African and one from New Zealand, chat while awaiting the signal to take off at Anzio, Italy. 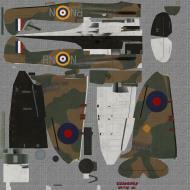 The aircraft is Supermarine Spitfire Mark VC, JK171 'RN-O'.